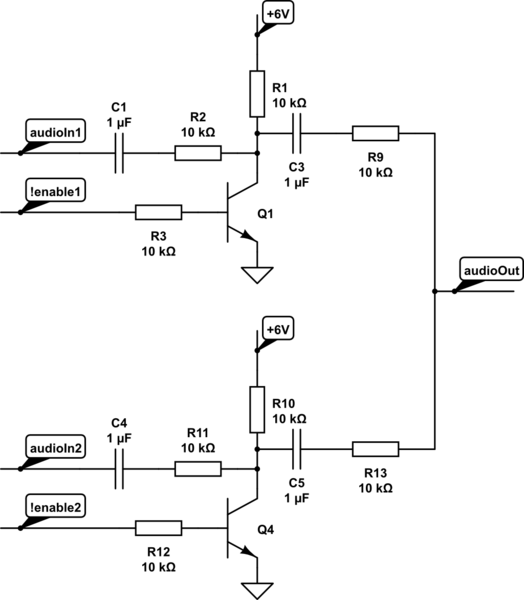 I was wondering which component is better for using as voltage controlled switch for audio signals (e.g. music signal from mp3 player). Should I use MOSFETs or BJTs? The max rail voltage is approximately 6 V? I cannot use any components other than BF199 BJT, IRF3205 MOSFETs, or STP16NF06L MOSFETs. My audio signal is DC biased so it does not go into the negative region. Edit: You stated that the transmission gate chip is made out of MOSFETs, so will MOSFETs be better for minimizing distortions? The super quick answer is: None of the parts that you have selected are appropriate for switching line-level (headphone level) audio signals. Off Topic Rant: It is often ill-advised to restrict the parts or techniques used in the answers. I covered this briefly in an answer on meta.EE.SE: Does EE.SE have a problem with the treatment of newbies? The old saying goes, "If all you have is a hammer, then everything looks like a nail." Currently, you only have a hammer. But you have no nail. Get the right parts and you will be much happier. The main issue that you have is that you want to switch a bipolar signal (a signal that has voltages that can be positive or negative), and you have limited power rails to use (+6v). The Bipolar Junction Transistor, in this case the BF199, is not going to work. Ok, if you used enough of them, in a particular configuration, then maybe. But I wouldn't wish that on an EE with 20+ years of experience, and certainly wouldn't suggest that for a novice. The MOSFET approach could be made to work (as Dave Tweed) suggests. But, there is a catch. Let's say that your audio signal can vary from +2 to -2 volts and Vgs(th) Max of your MOSFET is 4 volts. Then the gate voltage that you put on your MOSFETs must switch to +6 and -6v. The reason for this is when your switch is ON, you do not want the reverse body diode of the MOSFET to be conducting any current. And for that to happen, you need to have your MOSFET to stay on for any possible voltage of the audio signal. If your gate voltage is less, the MOSFET might be turning on and off and causing the diode to conduct. Because the switching time of the diode is not zero, and the diodes are really crappy diodes, there will be some distortion added. The amount of distortion will depend on the MOSFETs used, and is really hard to estimate. The resulting audio could be "telephone quality", or might be reasonable for the average listener. In general, the smaller and faster the MOSFET the less distortion you will have. The two MOSFETs you selected are not small or fast. So, you could get the MOSFETs to work, but you will need + and - power rails that are probably different than what you have available right now. The other issue with your MOSFETs is that they are just huge. Physically. You will need four of them to switch one stereo signal. If you are muxing several channels together then you will need 8 or more. That's a lot of MOSFETs. If we consider solutions that are outside of your selected MOSFETs or BJTs: Then an analog switch chip such as what Dave Tweed suggested, or similar ones by Maxim Semi, are good solutions. Pay attention to the On Resistance of these parts because that could be relatively high (30+ ohms for the cheaper ones). But otherwise, these chips are easy to use and effective. Relays are also good, especially when audio quality or a low on resistance is required. Latching relays could decrease power requirements by a lot. Another solution is to use a J-FET. J-FETs are the cheapest solution and have good to excellent audio quality, but are difficult to control because they require a huge voltage swing on their gates in order to turn on/off correctly. If you can get away with a relay, I would go for that. Easy to use, super high audio quality, and mostly bullet proof. The down side is higher power consumption and not suitable for mobile applications (shock and vibration). My second choice for you would be an analog switch. Good audio quality and easy to use. A distant third choice are the J-FETs. Hard to work with, good audio quality, and inexpensive. MOSFETs are fourth. And BJTs are a super distant fifth choice. For bipolar AC audio signals, your best choice would be a "transmission gate" chip such as CD4016 or CD4066, or an analog multiplexer chip, which is an array of such gates with a common connection. These devices have the most symmetrical characteristics, minimizing distortion of audio signals. Internally, they are a pair of back-to-back MOSFETs driven by complementary control signals. Basically what you do is short the input to ground by enabling the transistor. Disadvantage is that the output level will be at least 6dB lower than the input level. 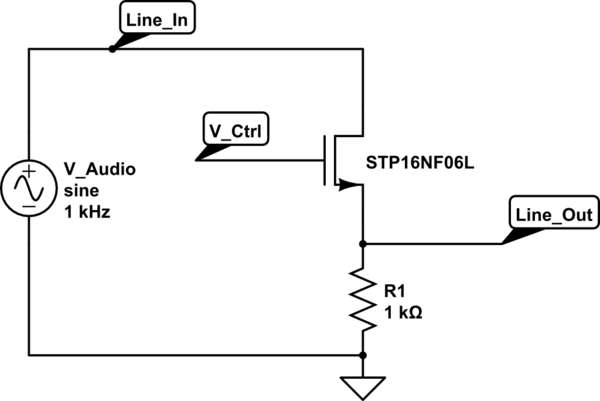 If you want to keep the signal level the same, you'll need an output amplifier. The stock el cheapo way of doing this that you find in Japanese cassette decks turns the bjt upside down so it is operating in reverse mode. This is not good for a headphone out, but works well for line out at consumer levels. Note that the output impedance is 2.2k, not good if you need to run long wires. This is pretty pop-free and effective at muting power-on glitches. You have to use a transistor that has good reverse beta to get a really low VCEsat for good muting. The drawing shows 2n3904 but that is just because the drawing editor would not accept the exotic transistor specs. If you use 2N3904 or similar you will not get complete muting. With good symmetrical transistors with high reverse beta you can get VCEsat in the sub-millivolt range. Please note, the transistor is intentionally connected backwards, it is not a drawing error! Assumption: Audio signal is a +4 dBU line level signal DC-biased to not go into negative region. Audio source has a low output impedance. Note that the signal will be clipped when the signal voltage approaches the linear portion of the MOSFET's VGS, which runs typically quite a bit higher than the VGS(th). While the datasheet states a minimum VGS(th) of 1 Volts, no maximum is given. For a 6 Volt control input to the Gate, and the assumed signal voltages above, the MOSFET should show a low on-resistance RDSON at VGS not greater than 2.463 Volts. The Line_out signal will require a buffer, to avoid attenuation due to loading. A simulation in Falstad is available here. The only component that you can use as a voltage-controlled switch is a MOSFET. A BJT (bipolar junction transistor) is a current-controlled switch. The collector–emitter is controlled by the base–emitter current. If you want a voltage-controlled switch, you should use a FET/MOSFET. The model of the MOSFET depends on the voltage and power dissipation. In this case, you could probably use either one. Not the answer you're looking for? Browse other questions tagged audio switches mosfet bjt or ask your own question. How to switch an AC signal on and off with a BJT? Crosspoint switch matrix for audio frequency signal?